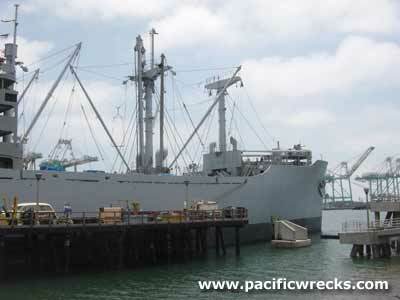 This WWII Victory ship is docked at San Pedro Harbor, near Long Beach, south of Los Angles. SS Lane Victory made two Pacific cruises at the later stages of WWII. Today, the ship is open for tours, and has a small museum inside the forward hold. It makes several day cruises each year for guests, and hosts events.